Before having to resort to surgery, Spinal Decompression can effectively be a way to treat neck and low back pain, including disc injury, sciatica, disc herniation and other chronic back problems. Many people who suffer from chronic neck and back problems feel they are forced to rely on pain medication with all their harmful side effects, or worse yet, undergo surgery and the risks that come with it, only to have a difficult rehabilitation program to look forward to. What these people aren’t told is that spinal decompression and chiropractic care can offer an effective, non-surgical alternative to treat their pain. As your Riverside chiropractor, the Chiropractic Health Club is fully equipped with the technology and expertise to the best chiropractic care and spinal decompression treatment. Come in for a free consultation and find out just exactly how we can help you, and get you back into a pain free life, without risking surgery or the adverse affects of medication. Spinal Decompression is computerized stretching of the lower back disc that creates a negative pressure in the disc that draws the liquid nucleus of the disc back towards the center (where it is supposed to be) and promotes increased blood flow to the disc (which increases healing). 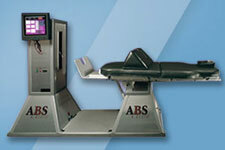 A Pelvic Harness and Thoracic Harness is securely strapped on, while laying on a comfortable memory foam table. The computer senses if your muscles are relaxed or not relaxed and self adjusts the amount of decompression pull, making the treatment very relaxing and painless. Spinal Decompression is good for Moderate to Severe disc problems, that don’t have an immediate surgical need. Have you been told that you need back surgery? Are you trying to Avoid Surgery? Do you have a moderate to severe disc problem? These are some great questions to ask yourself if you are considering treatment options. 1. Have a moderate to severe disc bulge or herniation, documented by MRI or chiropractic exam and x-rays. 2. Tried chiropractic treatment before, but the disc problem was more severe than expected. 3. Wants to Avoid Surgery. The Best Way to Confirm a Disc Problem is to have an MRI (magnetic resonance imaging) which shows both bone and soft tissue, as opposed to a normal X-ray which show bone only. If you have a PPO insurance, we can order a MRI for you, right away. If you don’t have health insurance, they can order a MRI for you and get you and possibly get you a discounted non-insurance price at a local MRI center. If you don’t have an MRI done, we can do an Exam and X-Ray and let you know if you potentially have a disc problem. Then he will tell you if Chiropractic Treatment or Spinal Decompression is right for you? Either choice is better than the alternative and risk of having Surgery.